SOULTRIPINDIA is a Creative Learning Experiential Program by Creativeland in which seven deserving candidates shall earn a fully-sponsored SoulTripIndia. As I love trips, am a good soul, have a Marketing Management background & am still a Student & I will forever be a Student, I felt I was perfect for it! I made an honest attempt to get shortlisted. In Round1 of the Contest, we had to send tweets to @Creativeland justifying that why we are "the most interesting candidate for this crazy, exploratory and possibly, life-changing adventure". I sent many tweets using #SOULTRIPINDIA & am delighted to be shortlisted for Round2! Posted my entry & now hope for the best to win! 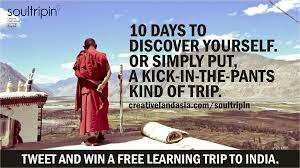 SoulTripIndia is perfect for me as I love Writing, Travelling, Indian Culture & Photography...! Being a part of SoulTripIndia will mean sheer magic for me as Imagination Meets Reality! I have won many Trophies, Medals, Prizes, Certificates in Academics & Contests! I believe in learning & sharing lessons imbibed, while sincerely attempting life's tests. For moments that are spectacular like India WOW! The Explorer in me is forever ready for Soul-stirring adventures & learning experiences! I celebrate when #IncredibleIndia amazes me & captures my senses! Pamper my soul, enjoy flavors & delights! Travel Miles, Spread Smiles & enthuse all to be HAPPY! As I get click-happy, you'll love my Videos & Photography! It's my playground & classroom where I learn & teach! Like the seven colors of the rainbow, our Team will delight! Seeing my Motherland thru Traveller's Eyes will be a great sight! I'll exceed expectations to make my Team-mates feel welcome! I'll share my learnings on the social media to educate & entertain! I'll rediscover my love for India all over again! 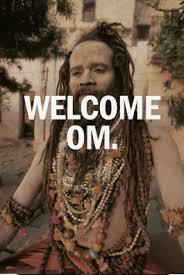 SoulTripIndia will be my voyage of Self-Discovery & Spirituality. Wanna bridge the gap & connect between Fantasy & Reality! I'll get lost, yet find myself! The Understanding, The Change, The Clarity will help!